Have you ever walked into a fuel site or convenience store only to see a tank gauge flashing warning lights that you are unaware of? Ever run out of fuel? Ever had a site down due to a PLLD shutdown? With the iTank service module these are all a thing of the past. Instant notification of alarms and fuel levels. You also have the ability to interact with the system remotely eliminating the need to send service people out to perform functions on the console. Fast alarm notification, periodic reporting, and easily accessible report archives are even more important with your tank inventory due to the potential liability and governmental regulations. The iTank Service works exactly like the iSite Service, except it allows you to automatically run and archive your tank gauge reports. 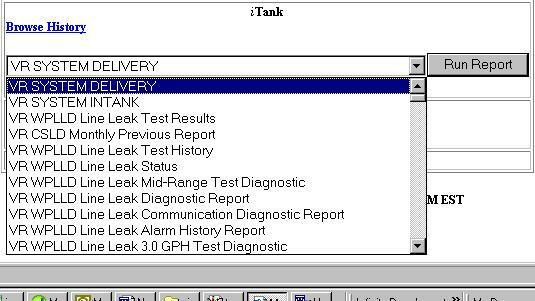 It scans the tank gauge reports that you designate, looking for the key events and alarms that you want to monitor. The iTank Service also allows you to communicate over the Internet directly to your tank gauge. Coupled with the iSite Service, you have a single connection to both your site controller and tank gauge, with access from anywhere in the world that you have Internet access. The iTank Service is compatible with Veeder Root TLS 250/350 or other Veeder Root-compatible tank gauge systems.